Another recent recipe we made was potato gnocchi (Dad—you’re forbidden from trying this recipe. Just trying to protect Mom and Kaia) with the students. Our professor has a great, easy recipe, so if you’re motivated, try it out. We made our own special Taleggio cream sauce to go with, which was pretty tasty. Definitely enough calories for a couple days! After having boiled and peeled the potatoes (the potatoes must be put on the cooker with cold water), mash them; if they are too mushy, add an egg. Place the mixed flour on a wooden board, add the potato mixture and make a dough. The dough must NOT be sticky. Roll the dough into a sausage-like form, as thin or thick as you prefer. Cut the gnocchi with a knife very quickly, without handling them too much. Sprinkle with flour. 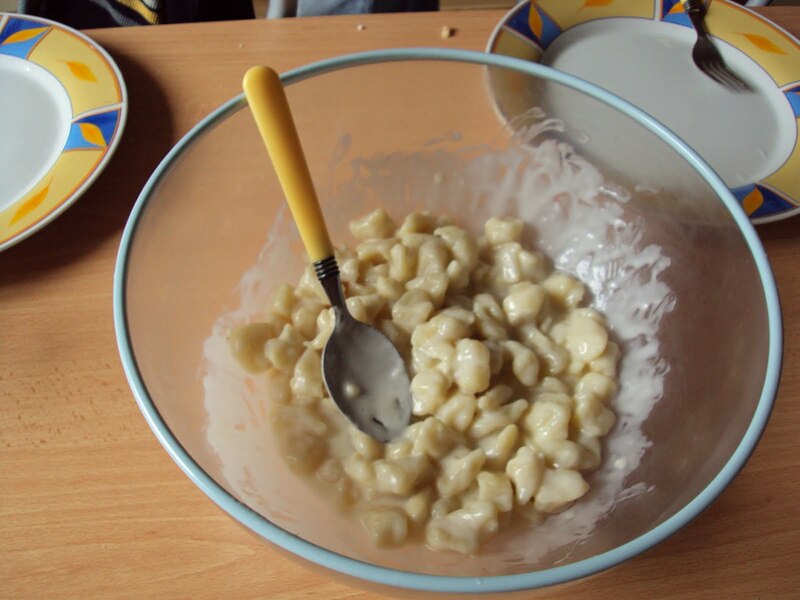 To maintain them: the gnocchi can be cooked straight away in boiling salty water. When you take them out of the water (as SOON as they float to the top), transfer them into a big enough container and pour some olive oil on them; they can be stored in the fridge for up to 5 days. Cut the Taleggio—which has a nice, creamy texture and a subtle flavor similar, I suppose, to blue cheese or gorgonzola—into chunks for easier melting. Melt butter, cream and cheese together, stirring frequently. Serve immediately for best taste/texture—that type of sauce likes to form layers of skin if left too long. Add to gnocchi (or other pasta) and enjoy! BUTTON. When you come back… you (and me hovering over your shoulder) in the kitchen, PRONTO! OMG, this is divine!! !